When you stop and consider just how many measuring tools there are in an average home, it's somewhat amazing. Measuring tools are used for animate and inanimate objects, and they're used for everything from clothing, food, walls and floors to the human body. Measuring tools are used all around the house. A yardstick measures three feet, the equivalent of 36 inches. Yardsticks typically are made of wood or steel. They commonly are used to measure floor areas, drapery, baseboards and walls. A sewing tape measure usually is made of a plastic-coated cloth. A standard sewing tape measure goes up to 60 inches. Sewers and crafters use the tape to measure fabrics and items according to patterns for clothing, and to make other types of crafts. 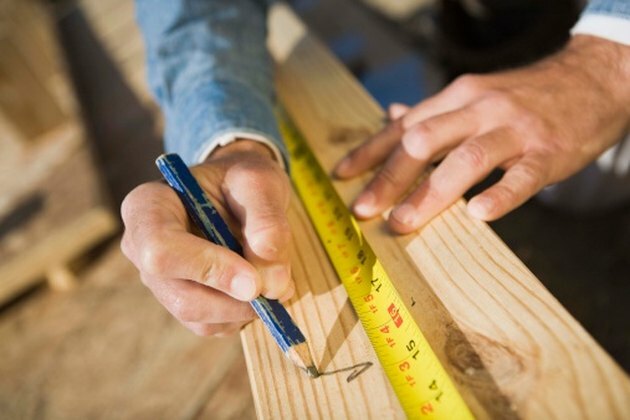 A steel tape measure is a tool of the trade of craftsmen, do-it-yourself homeowners and home repair professionals. A steel tape measure marks off inches. Most measuring tapes retract with the click of a button and snap back inside of a metal or plastic housing unit. A straight edge ruler is used when measurements must be precise. A straight edge is used in home wood shops, by crafters, for home improvement projects, and for architectural and graphics projects. Straight edges are made of aluminum steel and have measurements called "calibrations" in inches on one side, and in centimeters on the other side. Straight edges are made of steel and provides the user with the stability needed to make markings on the item being measured. Some steel rulers have a cork layer on the bottom for extra stability and water resistance. A thermometer is used to measure the internal body temperature of a human or animal. The most common thermometer is administered orally, and the reader is looking for a temperature that is 98 degrees Fahrenheit. If the temperature is below or above that reading, the caregiver may have cause to consult a physician. Rectal thermometers are used on babies, who might choke or not be able to manipulate an oral thermometer. A meat thermometer is inserted into cooked poultry, meats and lamb to make sure the food is adequately cooked. Foods that are not thoroughly cooked put eaters at risk for bacterial illnesses. Cooks use measuring cups and spoons to accurately measure the proper amount of ingredients to prepare recipes. Measuring cups and spoons are used for liquid or solid ingredients such as water, oil, flour and sugar. Measuring spoons are used for smaller measurements. A timer is most often used in kitchens. The timer may be a stand-alone instrument or an accessory. The instrument measures time in seconds, minutes and hours. Many appliances such as ovens, coffeemakers and microwaves have built-in timers.